In 2017, Environne’Tech, Emitech Group started off its industrial project “Bourgoin-Jallieu 2020” with an extension to its test centre for equipment qualification and environmental testing. The new 800m2 building is 10m high and designed for testing large-volume specimens such as aeronautic or rail components, as well as complete vehicles or major installations. It is equipped with special facilities such as a 93m3 climate chamber and very recently, a large-volume seismic bench has been added to the existing equipment. With the “Grand Carenages” nuclear plant refurbishment program, and after the accident at Fukushima, demand for seismic testing has grown considerably and specifications in many areas have been tightened. In response to this trend, Environne’Tech decided to invest in equipment specifically for this purpose. 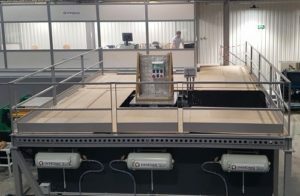 Compared to Environne’Tech’s existing bench, the new seismic bench has up to five times the test capacity and can handle heavier and more voluminous test specimens. The new table for component qualification measures 1,200 x 1,200 mm. The seismic bench excites two axes simultaneously with a force of up to 150 kN, and accepts a maximum payload of 3,000kg for the total spectrum and 500kg for the component spectrum. As well as doubling the test capacity, the addition of a second seismic bench provides Environne’Tech’s customers with more flexibility for their test campaigns. This makes the service faster, with a considerable reduction in lead times.